High quality designs delivering years of reliable service. The French Oil Mill Machinery Co. is an ISO 9001:2015 certified company and a member of the Process Equipment Manufacturers’ Association, a top management association for companies in the process equipment field. We strive to make Best-In-Class, Ruggedly-Built Machinery that provides our customers with many years of reliable service. 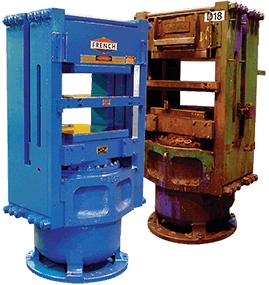 Many of our machines have an average life span over 50 years and operate with maximum productivity and lower processing costs per ton. Our company-wide quality management system meets the stringent requirements of the International Organization for Standardization (ISO), and regular audits are conducted by registrar Det Norske Veritas (DNV) Certification, Inc..
ISO 9001:2015 is only part of why French is The Technology and Quality Leader in the industry. New product development, innovative equipment designs, self-managed work teams in manufacturing, and process improvement teams have all contributed to meeting our goal of increased customer satisfaction. French’s “Q-100” Quality Program is shaping our future through teamwork, employee involvement, and continuous improvement. To us, quality is a satisfied customer achieved by quality people producing quality products — from a molding press to screw presses and more. 100% Quality from 100% of Our People 100% of the Time for our next 100 years and beyond.